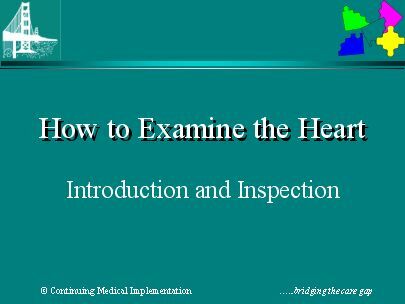 The physical examination of the heart and circulation involves five principle items: physical appearance or general inspection, the arterial and jugular venous pulses, the movements of the heart or palpation, estimation of organ size or percussion, and auscultation. Examination of the chest, abdomen and extremities may also reveal abnormalities reflective of cardiac disease. as a PowerPoint slideshow by clicking on the download button above.